During a videoconferencing with the president of Argentina, Salvarezza remarked the value of this project that places scientific knowledge in the service of the national sovereignty. Salvarezza during the videoconferencing. Photo: CONICET Photography. At the House of Government, in an event headed by the president of Argentina, Cristina Fernández de Kirchner, together with the minister of Science, Technology and Productive Innovation, Lino Barañao, the Pampa Azul Initiative was launched. During the ceremony, a videoconferencing was conducted and the president of the National Scientific and Technical Research Council (CONICET), Roberto Salvarezza, participated from the Puerto Deseado Oceanographic Vessel of CONICET in the city of Mar del Plata, province of Buenos Aires. Within this framework, Cristina Fernandez de Kirchner stated that “for the first time, we are not only going to the sea to swim and fish but also to research into our ichthyological richness with an strategic objective”, and added that Pampa Azul “should be a state policy that all governments should continue with because it is in the sea that the food richness is”. For his part, Salvarezza talked to the president and remarked that the initiative “links CONICET with the universities and the Science and Technology institutions of all the country”. Likewise, he stated that “the Council will provide more than 100 researchers that belong to 9 centres and institutions from all parts of Argentina”. Besides, he highlighted the presence of the Comodoro Rivadavia, the Oca Balda, Holmberg and Thomson vessels- which are part of the Pampa Azul Initiative- in Mar del Plata waters. “ It is not only about a project of the Ministry of Science, but also of the joint work with the porfolios of Foreign Affairs and Worship; Agriculture, Livestock and Fisheries; Tourism; Defence; Security; and Environment and Sustainable Development”, the president remarked. During the transmission, from Mar del Plata, the director of the National Patagonian Centre (CENPAT-CONICET) and CONICET researcher, Mirtha Lewis, stated that this project “makes researchers focus on certain areas considered as priority for the development of Argentina”. 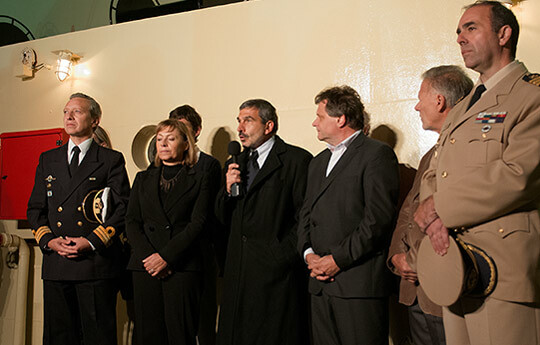 Furthermore, the Coriolis scientific coordinator and CONICET researcher, José Luis Esteves, highlighted that “the experience gained from this vessel allowed us to investigate the San Jorge Gulf, which is the biggest gulf of Argentina and has a great potential from the fishing point of view as well as the exploitation of hydrocarbons”. presence for the sovereignty of our country in the South Atlantic Ocean area. This strategic project envisages a line of work of 10 years and includes interdisciplinary scientific campaigns that comprise 5 areas defined as priority, using traditional platforms such as oceanographic vessels and underwater vehicles with long distance operation; the technological development of resources through in situ and satellite automatic records; and the development of capacities to generate and maintain the database with continuous and public records. The priority areas that the initiative covers are the following: Burdwood Bank; the Blue Hole at the continental slope; the San Jorge Gulf; subantarctic marine areas, which include the South Georgia and the South Sandwich Islands; and the Rio de la Plata estuary. In order to include them, several research vessels are going to carry out different oceanographic campaigns with CONICET researchers, among others, where some projects related to the study of those areas are going to be conducted. So far, in the missions performed these vessels participated: – RV Coriolis II (February 2014), the Burdwood Bank; Dr. Holmberg (April 2014), South Georgia; the Puerto Deseado Oceanographic Vessel of CONICET (from January to April 2014), Antarctic Campaign. Pampa Azul is coordinated by the Ministry of Science, Technology and Productive Innovation through the Scientific and Technological Cabinet (GACTEC). Besides, other institutions participate: the Ministry of Foreign Affairs and Worship; the Ministry of Agriculture, Livestock and Fisheries; the Ministry of Tourism; the Ministry of Security; and the Secretary of Environment and Sustainable Development. Apart from CONICET, there are other institutions involved: the Argentine Antarctic Division (DNA); the National Commission on Space Activities (CONAE),the National Institute for Fisheries Research and Development (INIDEP); the Hydrographic Service (SHN); the Argentine Coast Guard; the Austral Center for Scientific Research (CADIC, CONICET); the CENPAT (CONICET); the Argentine Institute of Oceanography (IADO, CONICET-UNS; the Research Centre for the Sea and the Atmosphere (CIMA,CONICET-UBA), the Almirante Storni Institute of Marine Fishery Biology (UNCO); the National University of Comahue; the National University of the Patagonia San Juan Bosco; the National University of Tierra del Fuego, Antártida e Islas del Atlántico Sur; the National University of Patagonia Austral; the National University of Mar del Plata; the National University of the South, the National University of La Plata; and the University of Buenos Aires.